HALIFAX, Dec. 12, 2018 — (PRNewswire) — DHX Media (or the "Company") (TSX: DHX, NASDAQ: DHXM), a global children's content and brands company, is pleased to announce that it has struck ten new distribution deals for the hit family series, The Deep, bringing the total number of broadcasters and streaming platforms for the CGI-animated underwater adventure series up to 40 globally. The news follows a 2018 BAFTA (British Academy of Film and Television Arts) nomination for best International Animation for season two of The Deep, co-produced by DHX Media and A Stark Productions. New deals for season three of The Deep, which was commissioned by ABC Australia earlier this year, have been struck by DHX Media with CBBC (UK), Super RTL (Germany), VRT (Belgium), NRK (Norway), KidsZone(Baltics), S4C (UK and Wales), SVT (Sweden), and TVP (Poland), in addition to previously announced deals with Netflix (worldwide) and Family CHRGD (Canada). DHX Media has also signed two new distribution deals for seasons one and two of The Deep, with France Televisions (France) and RTP (Portugal). Seasons one and two of The Deep air in 190 countries. "From the moment it premiered, The Deep has resonated with kids and families for its wonderful animation and strong storytelling," said Jerry Diaz, VP Distribution, DHX Media. "The series continues to generate strong sales into markets around the world, and the talented creative team behind The Deep have done an amazing job on season three, delivering a great new set of adventures for broadcasters and streaming platforms to share with audiences." In season three, the Nektons are back and the Monumentials—huge creatures capable of changing the world—are waking from their long slumber! To put the giants back to sleep, Ant, Fontaine, Will and Kaiko must find the ancient city of Lemuria and harness its secret. Dangerous pirates, fantastic creatures and tantalizing mysteries will confront them along the way. But even with unexpected help from Jeffrey the Fish, they're running out of time. The Deep is based on the Aurealis Award-winning graphic novel series of the same name, created by multi-award-winning, best-selling comic book author and playwright Tom Taylor (All-New Wolverine, Earth 2, Superior Iron Man, Batman: Legends of the Dark Knight, Injustice: Gods Among Us, Star Wars: Blood Ties). The graphic novel series is illustrated by James Brouwer (Justice League Beyond) and published by Gestalt Comics. 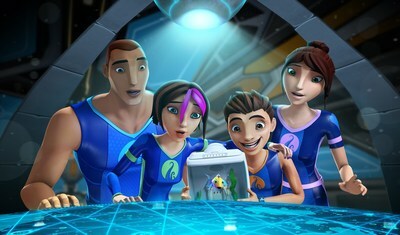 The Deep is a global hit that has garnered numerous industry awards and accolades, including a 2018 BAFTA nomination for best International Animation, Best Music for Children's Television at the 2018 Screen Music Awards in Australia, the 50th Annual AWGIE Awards in Australia for Children's Television (5-14 years old), the 2017 Kidscreen Award for Best New Series (Kids Category), the Golden Sparrow Award at the 2017 German Children's Media Festival. The Deep toys debuted in Fall 2018 in Germany, Austria, Switzerland, UK and Nordic countries, and quickly became Simba Toy's bestselling boys' property in Germany. Bloomsbury has debuted a range of books based on the series in the UK and Australia, including young fiction, an official handbook and activity-based books; and Blue-Ocean Magazines launched The Deep magazine in Germany. A larger rollout of toys, books and more is expected in spring 2019 in these territories as well as France. A Stark Production Pty. Ltd (ASP) is a leader in the creative development and production of quality children's animation and teams with global partners to deliver successful internationally co-produced shows. From its inception the company has been led by Avrill Stark, an independent and highly creative producer who has teamed with companies to produce series across a broad age range, preschool – teens. She has received many nominations and awards for outstanding animation: the prestigious UNICEF Award at Annecy, the Elan Award for Best Animated Television Production and numerous nominations for the Australian Film Industry (AFI) Awards. ASP prides itself on the development of both series and feature films with a diverse appeal both in animation and live action for children. Above all we make 'having fun' a priority in our pursuit of excellence! CPLG ( www.cplg.com) is one of the world's leading entertainment, sport and brand licensing agencies with offices in the UK, Benelux, Nordics, France, Germany, Italy, Spain, Sweden, Poland, Middle East, Greece & Turkey and the US. Owned by DHX Media ( www.dhxmedia.com ) a leader in the creation, production and licensing of family entertainment rights, CPLG has more than 40 years of experience in the licensing industry. It provides each of its clients with dedicated licensing and marketing industry professionals and a fully-integrated product development, legal and accounting service. CPLG believe that partnership is about clarity, openness and trust, and is widely known for its no-nonsense, straightforward approach; Expert Common Sense.